Undersong is an exhibition of Lithuanian artists Lina Lapelytė and Indrė Šerpytytė coorganised by the Vilnius-based art centre, Rupert. Following Rupert’s commitment to supporting a young generation of Lithuanian artists in reaching an international audience, the art centre shows two renowned Lithuanian artists at the first major presentation of their work in Latvia. Though Lapelytė and Šerpytytė have different and independent practices, both explore the relationship between cultural and personal identities, collective and individual memories, and investigate different modes of communication and collaboration. Undersong shows how the artists turn to these ideas in a body of work where ritual, rhythm and repetition are central. Lapelytė’s performances take a close look at the discipline – both empowering and exhausting – needed to perform movements repetitively, and the creative opportunities and difficulties that emerge in challenging rituals and stereotypes. 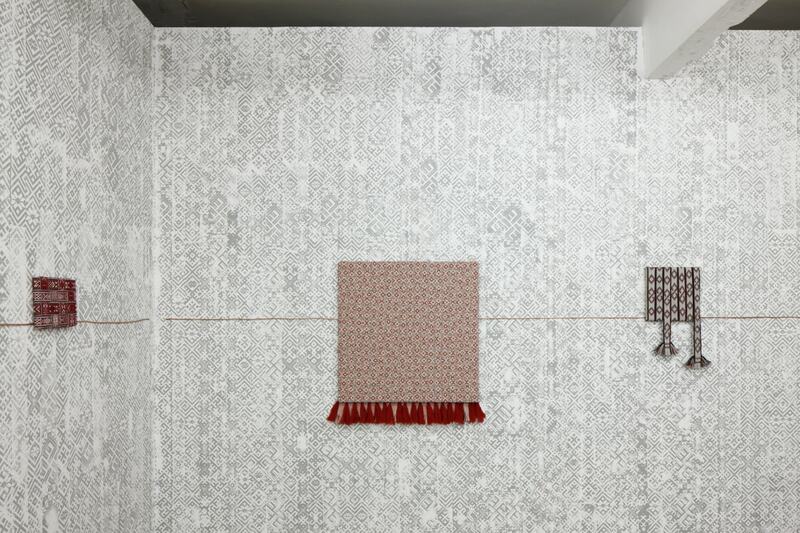 Šerpytytė investigates how the making, exchange and ritual use of traditional woven sashes found across the Baltic States both inform and are informed by shifting cultural and political dynamics, examining how folk traditions are central to the formation of local and State identities. For both artists, repetition is explored as an inherently performative mode whereby identities are consolidated, communities emerge, and discipline is established. At the heart of their work is a focus on the detail – the subtle modulations of a performer’s body, the intricacies of ornament on the woven sashes – as a complex site of aesthetic and political concerns. With a professional background in music, Lapelytė’s performances are often constructed as songs, or more specifically, sutartinės (traditional Lithuanian polyphonic songs), where melodies are symmetrical and consist of equallength parts, and where repetition is key. This background in music informs Lapelytė’s pieces for this exhibition, all of which were first shown in her solo show at Rupert (November- December 2017): Pirouette and Mickey Tale , and a sound installation, The Trouble with Time , which comprises of a complex layering of songs composed for texts written by a selection of artists, as well as sounds recorded with Rhodri Davies at the French pavilion from the 2017 Venice Biennale. These works examine our relationship to ageing, and to physical, mental and professional endurance. Lapelytė explores how we can negotiate social and cultural norms through collaboration and performance. 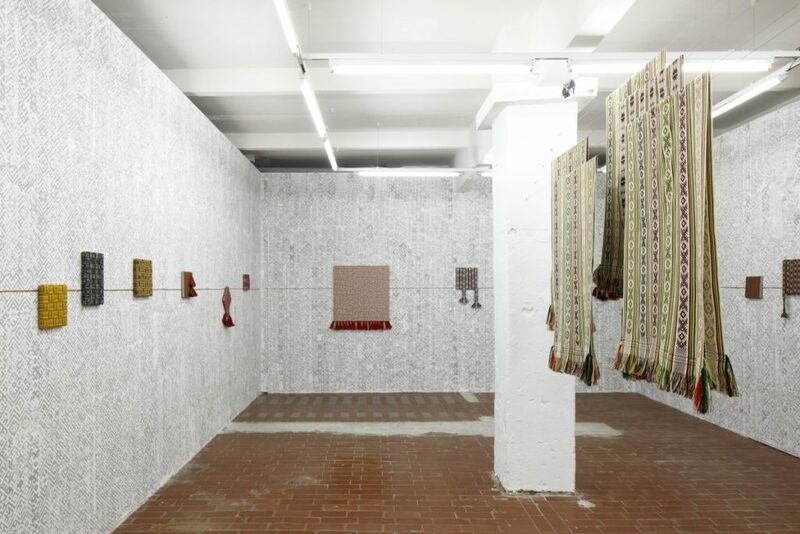 Šerpytytė’s installation, From.Between.To uses traditional woven sashes from across the Baltic States to explore how local cultures and communities intersect with broader political narratives, such as nationalism and consumerism. Her work asks what the repetitive ornamental patterns on the sashes mean and do. She looks at the ways in which the repetitive act of making these patterns consolidate a language of meaning and a community of understanding, but are also part of an activity of creative agency for various individuals and communities. From.Between.To considers these ritual sashes as sites of memory and identity formation, as well as indices of changing modes of use and consumption. Undersong brings together these installations and performances to consider how the rhythms and artefacts which structure our everyday lives can be both limiting as well as the means through which we can explore creative approaches to resistance and personal and collective histories. Rupert is a centre for art and education devoted to establishing close cooperation between artists, thinkers, researchers and other cultural actors through interdisciplinary programmes and residencies. A knowledge-based platform for innovative creative work, Rupert integrates with the social and cultural framework of the city of Vilnius while also fostering a strong international focus. Rupert’s mission is concentrated in three distinct but closely-linked channels: the Educational, Residencies and Exhibitions programmes. Through these research – and development-oriented programmes, Rupert supports international thinkers in realising their projects and establishing creative careers on an international scale. Rupert focuses on contemporary artistic and curatorial practices, but remains close to an extensive range of disciplines, actively encouraging transdisciplinarity. Indrė Šerpytytė (b.1983, Lithuania) is an artist based in London. Her work has been exhibited internationally. Recent solo exhibitions include those at the Contemporary Art Centre, Lithuania (2017); Parafin Gallery, London (2016); Still House Group, New York (2016), and the Museum of Contemporary Art, Krakow (2015). Important recent group exhibitions include, Age of Terror: Art Since 9/11 at the Imperial War Museum, London (2017/2018); The Image of War at the Bonniers Konsthall, Stockholm, Sweden (2017/2018); Ocean of Images: New Photography 2015 at the Museum of Modern Art, New York (2015); Conflict, Time, Photography at Tate Modern, London and the Museum Folkwang, Essen, Germany (2014-15).